Happy February 15! If Valentine's Day didn't go quite as you hoped and you need to console yourself (or plead forgiveness) with chocolate, then follow along for some super easy chocolate cupcakes! They're also good if you just want to shower someone with extra chocolatey affection and have something yummy to nibble on with your coffee, tea, or a glass of milk! We have a lot of birthdays to celebrate in February, so this recipe often appears about now for that reason. Of course, this year, we're mostly occupied thinking of the expected new birth day, which will probably be sometime in March! 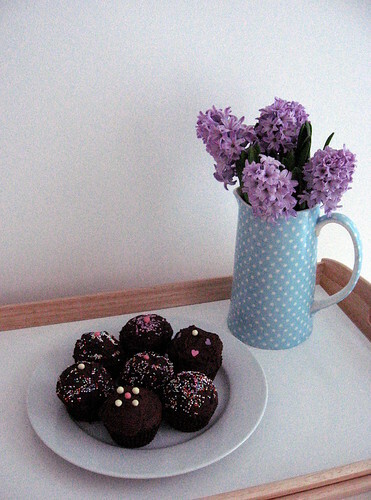 In any case, I made these last night and I must say, cupcakes for breakfast are delightful! Makes a batch of 24, so you'll have plenty to share (or freeze for later). Preheat oven to 375°F or 180°C. Bring to a boil and remove from heat; stir until shortening is melted (put on heat again if necessary). Whisk well to get out the lumps. In a pinch, you can replace the sour cream or yogourt with milk or soy milk, but use a scant 2/3 cup or it will be too runny. Ladle the batter into greased or lined muffins tins (or silicone muffin cups) and bake for 15-20 mins. You can also make this as a cake in a 9x13" pan or two round 8" pans and bake it for about 35-40 mins. I like to decorate my cupcakes with lemon or mocha icing and sprinkles. I use about 2 c of icing sugar to something like 1/4 or 1/2 c of butter. Do not even think of using anything other than butter! I don't really measure it, but just adjust as I go until it tastes "right" and is a good consistency. If you're making the lemon icing, then thin it out with lemon juice and add the zest of 1 lemon. If you're making the mocha icing, then replace some of the icing sugar with bittersweet cocoa powder and thin it out with strong coffee. Spread the icing on your cupcakes, add some fancy sprinkles, and then gobble with glee! 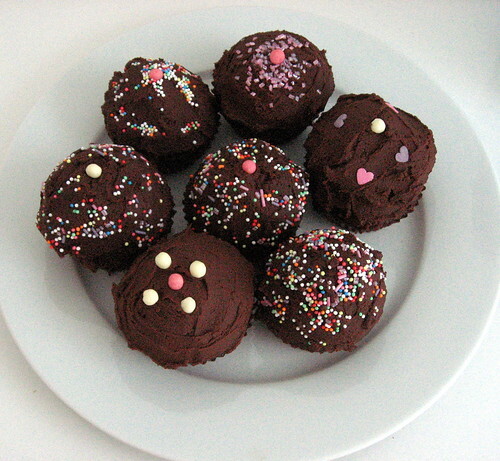 I tried one of your chocolate cupcakes this morning and they were really delicious! @Erica - Thank you! It was fun to send him off to work with goodies to share. You can find all my past recipes in the Food section, in the tabs along the top.